made in dupion raw silk, plain and tussar silk, also velvet material etc. 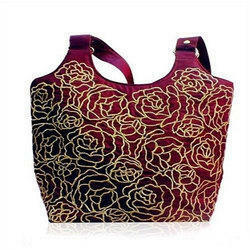 With attractive hand embroidery in silk and gold thread, sequins, beads, etc. With matching fabric handle, leather handle or beaded handle. a variety of colors and designs to choose from. Various shapes and sizes are also available. Pure silk handbags with embroided work and ethnic look as the most distinctive collection ever for ladies with varied patterns, designs and colors. Redefining fashion with pure silk is our specialty. 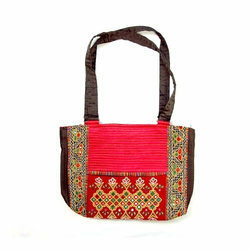 Ethnic yet stylish collection of handbags with best quality.